The Zip chair from Allseating features multiple user defined adjustments and bright aluminum finish details for a seating solution that is as comfortable as it is stylish. 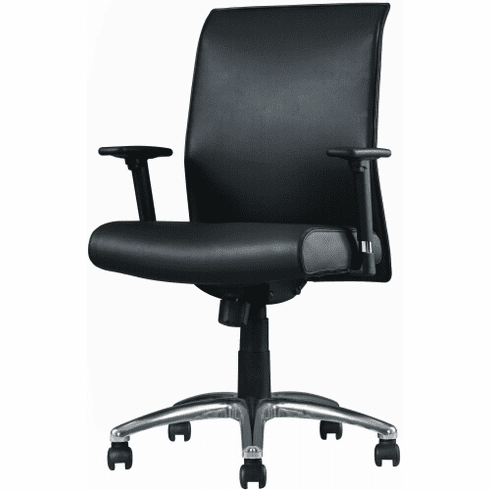 Features of the Zip task chair include thick, foam padded seat and backrest cushions, durable and easy clean leather upholstery, pneumatic seat height adjustment, 360-degree swivel, tilt with tilt lock, tilt tension adjustment, back height adjustment, seat depth adjustment and a heavy duty bright aluminum finish base with dual wheel carpet casters. The Zip chair meets or exceeds ANSI/BIFMA standards. Dimensions: Seat Size: 19"W x 18"D. Back Size: 18.5"W x 21.5"H. Seat Height Adjustment: 19" - 23.5"H. Overall: 39" - 44"H x 28"W x 28"D. 10 year warranty from Allseating. This chair normally ships within 3-4 business days from Toronto CA.